Adorable! Bought for our RV outdoors and it is so cute and does a great job helping keep dirt out of the camper. Decorate your home in a bold and colorful way with this floral area rug. 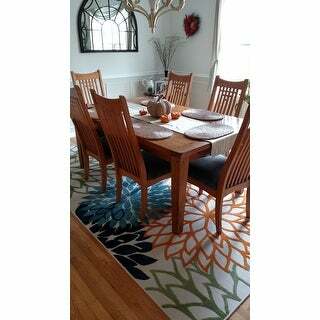 This rug features colors of blue, green, orange and red. This rug is made with 100-percent polypropylene and will provide a clean and contemporary to any room in your home. 42.0 In. X 6.0 In. X 6.0 In. Dimensions 42.0 In. X 6.0 In. X 6.0 In. I originally had purchased the smaller version of this rug, but had to buy the larger one in order to accommodate the entire outdoor table and chairs. I loved the look, and several friends have asked where it was purchased. I was so excited upon its arrival because I have wicker chairs in multiple colors that match the colors in the rug. Since it is advertised as an "outdoor" rug, you would expect it to hold up to the elements. We put it down the end of April, and two (2) months later it is badly faded . . . mainly the red is washed out. The smaller rug at one of the doors remains colorful, but has no red in it. I will contact Overstock, but since I've had it over 30 days and the rug has been used, I don't know how they will deal with the quality of this rug. Was so excited when I received it so this is quite disappointing. This rug looks amazing and is exactly what I was looking for to bring in some bold color to my living room! Most pictures and reviews are for the rug being outside, so I wanted to give some info to those considering it for indoors. To start - it is a very nice quality. The flowers are soft and raised from the tan/off white part, which is a more durable carpet material but doesn't have the outdoor plastic rug look. I like that it'll withstand cleaning since I have two dogs and frequently vacuum and steam vac. Overall, if you're contemplating using this indoors I would give it a go. I'm very glad I did. 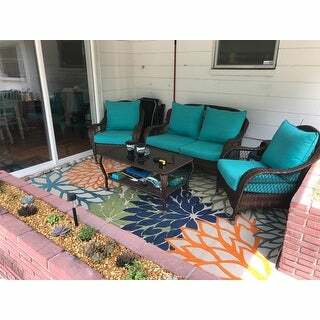 The BEST Indoor/Outdoor Rugs I have ever ordered and owned. I am using the 5'3 x 7'5 and the 7'10 x 10'5 rugs strictly outdoors to complete my Hawaiian decor, fantasies include a Luau every day beginning at 5:00 pm with men kissing my hand and saying Mahalo to get an invite!!! Just kidding, but this is for sure. 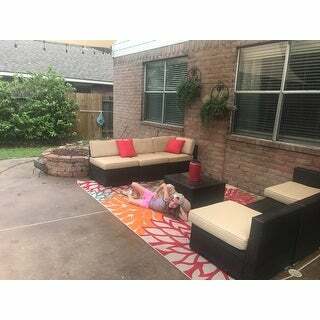 I designed 1/3rd portion of my backyard into a covered oasis, completely designed and landscaped the area into a tropical setting, and the Nourison Aloha Floral Rugs was the perfect fit to the whole design which was lacking before I ordered them. The colors are vibrant, it has rained many times and they dry quickly with no water marks or color stains. The quality is outstanding! I've already thought about ordering a spare set in the same sizes for when the existing ones wear out but I haven't yet because there still isn't any sign of wear and tear. The BEST BUY for your money, I'm not kidding. I ordered the rug it arrived when promised. The rug was well packaged. 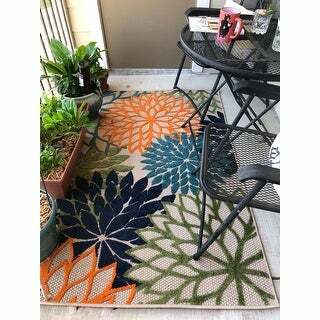 The foundation of the rug is a tightly woven firm low pile beige/taupe color and the flowers are a medium pile semi firm texture the colors are vibrant and bright aqua, orange, royal blue, and a fern green . I have it in my sunroom, and it works perfectly with my wicker furniture. It's nice but casual could be used outdoors or indoors in a play room or family room. My only issue with the rug was getting it to lay flat. I had to place weights around the rug and leave them on the rug for 3 days. It now lays flat and I'm totally satisfied with my purchase. 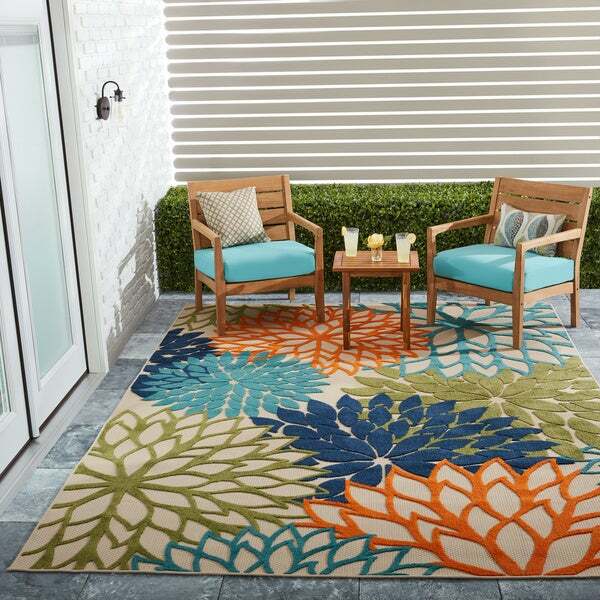 The Nourison Aloha Floral Indoor/Outdoor Area Rug is a great buy! Vibrant colors and excellent quality. The picture doesn’t due it justice. Strongly recommend ! 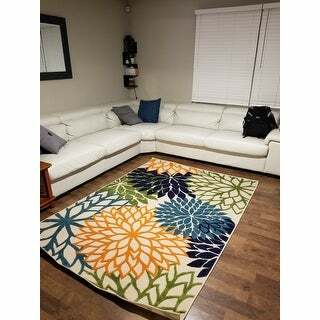 Love this rug it has great color that will work in any room will buy again will let others when they ask about the rug where I I purchased. Love. Love. Love. I am answering a question Someone has a question on this rug style it does not have a rubber back very nice rug I use it on ceramic tile floor I do not need rug pad not needed. If you use it out doors on deck you will not need rug pad either. Love these rugs beautiful bright colors. I am answering a question. The rug is low pile and soft to touch but does not hold dirt in pile of rug great for indoor and outdoor use. Would recommend great rug. I love the colorful pattern of this rug. I originally ordered the 5’x7’ rug, but it turned out to be too large for the area it was to be used. I returned it (Overstock made this an easy process) in exchange for the 5’3” round rug. It is perfection! Just what I wanted in my otherwise drab kitchen - I rent so I am limited in what I can do to make this space my own. I did spray the rug with waterproofing Scotch Guard. The colors did not bleed, it’s a vibrant addition to my home. I recommend this rug (manufacturer) to anyone who needs a pop of color in their space. 5 stars for this product! I'm very happy with this Overstock purchase. I bought this rug to go on my outdoor deck. It is well made and the perfect size. The colors brighten the area and add the color I was looking for. This item shipped quickly and arrived exactly as described. I would recommend this rug to a friend. Great rug, soft on the feet in the flowered areas the background color area is a little coarse and tougher on bare feet. Only issue I have is the loops of the carpet flowers being pulled or snagged which has already happened in some places. Which is why I gave it one less star. If this is the only rug you'll ever buy, use caution. But if it's an outdoor rug you'll probably only keep for a few seasons, it's great. Love this rug! It really brings a playful feel to our outdoor patio area. Love all the colors it brings to our otherwise very white house and looks great with the succulents I’ve planted. Love it! bright and beautiful! Beautiful rug with amazing color. Looks great on my patio with all my plants. The rug was soaked in a storm and surprisingly was dry 2 days later with no direct sun. Yes, this rug just gave my dining room a face lift. It's a breath of fresh air. Was a little hesitant thinking it might be a risk to go so bold ( I'm usually a bit more conservative) but boy am I glad I took the plunge! Love it! I'm using this outside on my patio. So far it is holding up to the rain and not fading in the sun. Well made, will update as time goes on. It is a very well made and high quality outdoor rug.I love the colors on this rug! It looks awesome with my outdoor furniture cushions in both the green and in blue shade/s. I plan to sue orange and the aqua accessories to pull it all together. We have put this rug on our deck. The colors are so vibrant. I walk on it bare foot, it is so soft and comfortable. Out little dogs love it too, they have something to lay on when they are outside. Beautiful outdoor rugs that have weathered very well since last summer. They bring color and brightness to our outdoors area. We enjoy them a great deal. The colors are beautiful and vibrant. Looks great on my front doorway. It is a great addition. It dries quickly and easy to clean off. The price was better on Overstock then on other stores. Beautiful runner for spring/summer time! Much higher quality that we were expecting. Vibrant colors! And soft on our feet. It looks fantastic with our outdoor sectional and throw pillows. The flowers are a raised pattern that feels like fleece. This rug is so much fun and I've bought several to put into rentals. Has a low high pile, washes off with mild detergent and the hose! The colors are very true to the photos, and I've used them indoors and outdoors in Florida and they hold up just fine. "Does this rug hold water when it rains? Or does it dry out fast?" I have mine under a covered upper deck porch, it was there all last summer. I never found it soaking wet a little damp round the edges perhaps, seems to dry quickly. I'm really pleased with the rug. We did take it inside over the winter, I want it to last. My experience - when it is warm outside it dries out fast, within a few hours. The material under the under the rug (wood/concrete) may take a little longer to dry out. I have this rug on a covered patio, so it doesn't get super wet, but when it does, it seems to dry out fairly quickly. "I see in some of the pictures that the edges roll up? Would this be a tripping hazard for older adults? Would you have to use carpet tape to keep them down? Any other suggestions on how to make it lay flat?" This item lays easily once unrolled. The best suggestion is to place heavier items on the edges for 1-2 days to lay edges flat. If there is true cause for concern on the edges rolling up, then yes taping them down would be safest. I put the rug outside on our patio and had no problem with it laying flat. I the rug needed to be flattened, I imagine you could use double faced carpet tape. Love the rug!!! "can this go outside on my concrete patio in the south"
Yes, it can go outside on a concrete patio. "Would this rug be good inside in a high-traffic entry way? With mud and dirt coming inside from kids? I’m looking for an alternative to a typical brown or grey entry way rug. " Yes our indoor/outdoor rugs are perfect for high traffic areas. If they need to be cleaned, it can be easily cleaned by hosing it down. "Where can I find the chairs in this photo?" I saw them on the Overstock website once. "Those that have this rug, do you think it would work in a classroom for kids to sit on for a limited time? Or is it "scratchy?"" Not comfortable to sit on, no padding but not "scratchy". I don't think it is scratchy. It is a great size for a classroom, plenty of room for kids. It does not have any padding on it, but for kids it is sufficient since they are wiggle worms. I would recommend. Yes for limited time would be good. This carpet is light in color so if kids are eating on it would not be good. "All buyers have used this rug outdoors. Is it appropriate indoors. The style and colors are perfect for my space, but I would like to certain before purchasing." Yes, it is! I have mine indoors. I've received several compliments and from almost anyone who pays attention to details like that. It is very nice and just as it looks in the picture. It's amazing that it can also be used outdoors! It makes the space cozy, too. I imagine that you can do lots of things or create whatever atmosphere you like with this rug. I like it! Yes, I ordered it for the living room of our home in Puerto Vallarta where I paired it with an apple green loveseat. Love it!